The internet represents the democratization of information. This is never truer than in the realm of learning. Once upon a time, to learn a skill you had to seek out experts in the field to teach you, enroll in a college or university, or grab a textbook. Today, excellent video courses are offered from many platforms online. 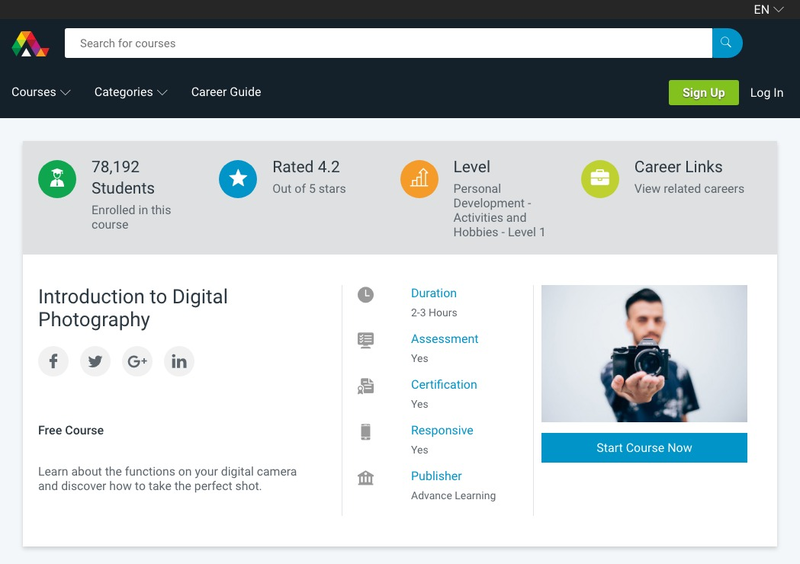 From amateurs with YouTube channels to Ivy League university programs, the number of online photography courses available grows every year. 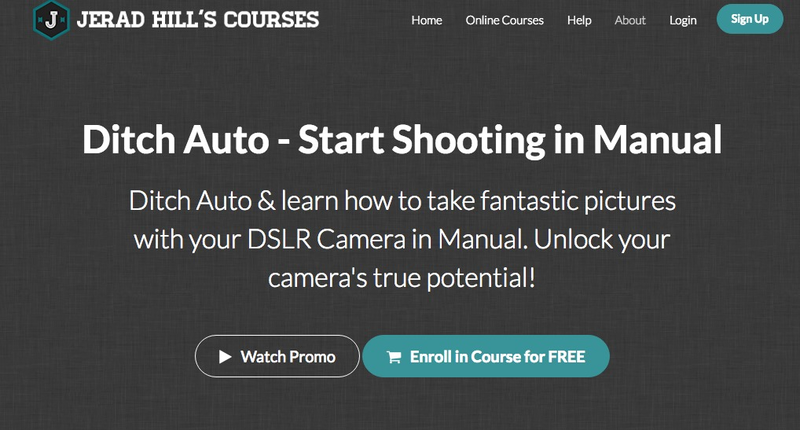 Many of these photography lessons options are free, but the highest quality courses are purchased or viewed using a subscription service. These high-quality courses require a lot of time and knowledge to put together, and when done well they can be just as useful for student learning as any apprenticeship or higher-education classes. Alison is an Irish-based web learning company that offers diploma and certificate course online. Their classes are free and wide-ranging. From learning a foreign language to mastering web design, Alison has great courses available to be taken anytime. 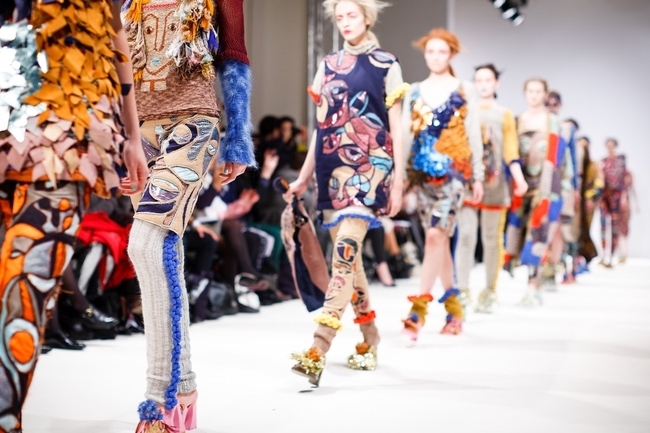 Alison offers a photographer career path which includes 16 different classes. Alison offers several free online photography courses, including a diploma program for digital photography. Beginners can try out their course offerings by taking the Digital Photography for Beginners course. This course covers basic image composition, using and picking digital cameras, and other great tips to help you get off on the right foot. This hour and half long video course from Udemy offers a lot of value to beginning shutterbugs. The course covers camera basics including controlling autofocus modes, controlling exposure and metering modes, and controlling the depth of field. The course goes beyond camera settings too and introduces compositional concepts like the rule of thirds and leading lines. 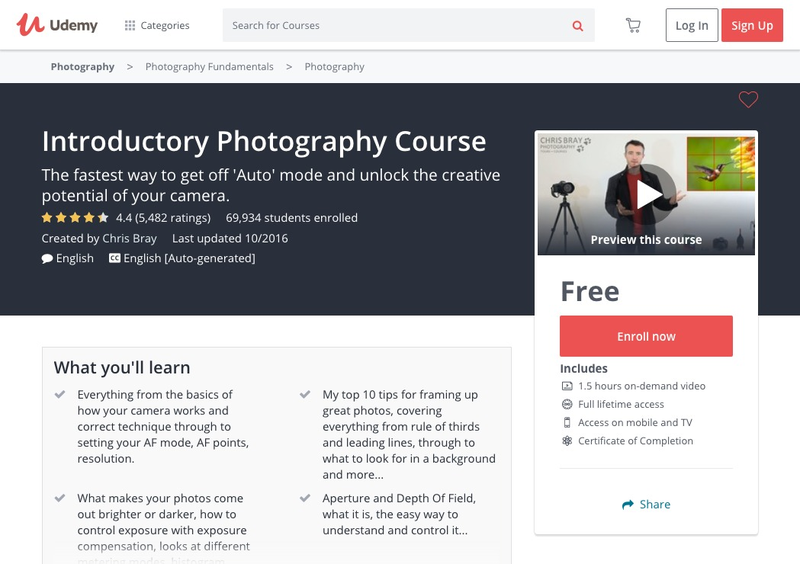 Another one of the free photography courses offered from Udemy, this short course encourages students to get out of the automatic camera modes they’ve started out in and explore the world of manual control. By teaching you to master the exposure triangle for aperture, shutter speed, and ISO, you can enjoy complete creative freedom with whatever type of camera you pick up. Craftsy is a website dedicated to educating craft makers and artists using quality video lessons. Topics on the site are wide-ranging: from knitting and cooking to gardening and photography. 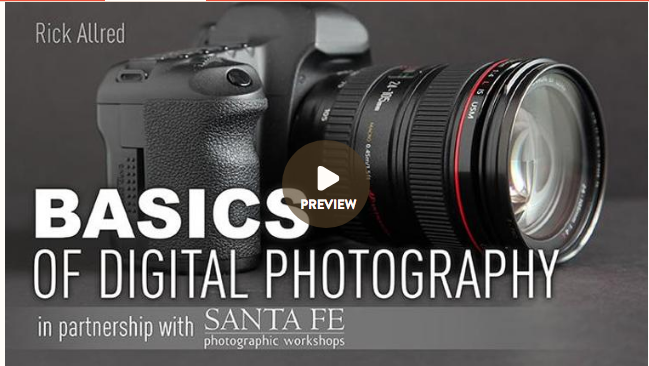 The Basics of Digital Photography course was created in collaboration with the Santa Fe Photographic Workshop and features nine HD video photography lessons given by instructor Rick Allred. Topics included cover light and exposure, shutter speed, aperture, ISO, lenses, and composition and creativity. Among the many online digital photography courses offered on Craftsy, this Photoshop essentials course is a gem. No list of online photography courses would be complete without at least one Photoshop course. Even if you don’t personally use the program, chances are you will use it for an employer or come in contact with it at some point in your career. Other photo editing software programs that you might use have undoubtedly been designed to look and feel like Photoshop, so learning Photoshop has become a defacto requirement for being a digital photographer. 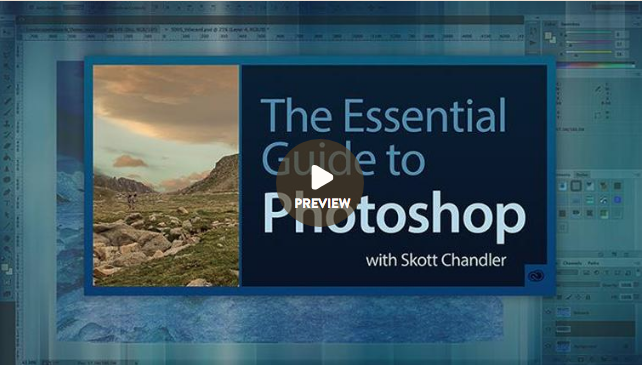 This course, presented by Skott Chandler, consists of 14 video sections and covers basics like using Bridge and Camera RAW to organize files and import camera RAW files. Retouching is divided logically by the type of photograph you are working with, be it portraits, landscapes, or vintage photo restorations. Skillshare is a varied community of online video courses. 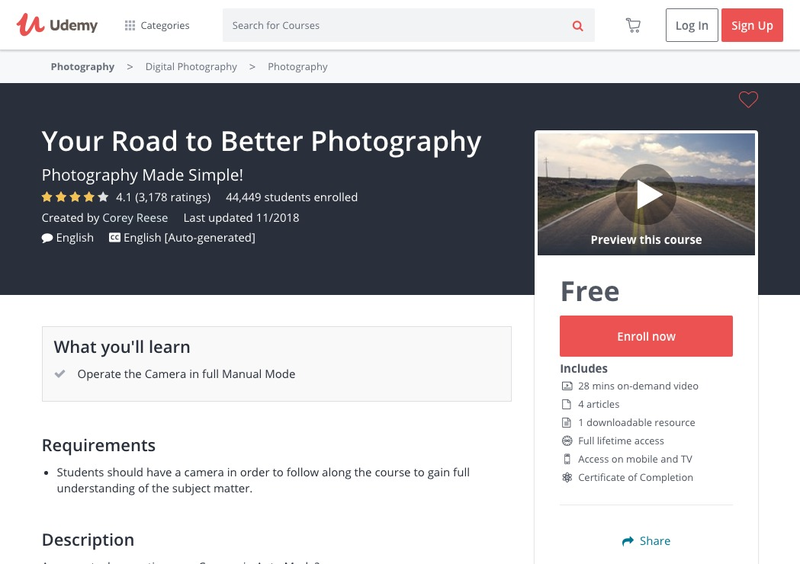 The site offers many free online photography courses to try out, but an inexpensive monthly subscription fee gets you access to over 24,000 classes. The site offers a one-month free trial to try it out, so you can probably even complete a premium class or two for free. The DSLR Photography course consists of 11 chapters of videos that cover using your camera for everything from street photography to portraits. Even the free courses like this one on Skillshare have a lot to offer. Additionally, there are several introductions to photography courses, as well as several Photoshop and Lightroom tutorials. Classes include projects which you can share and compare with others in the Skillshare community. Another of the great photography courses online offered by Skillshare is this course focusing entirely on composition. 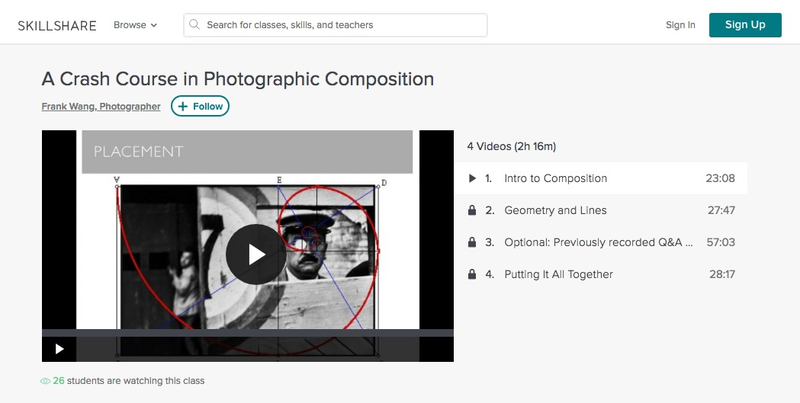 Featuring over two hours of videos and materials, the course covers all aspects of composition, geometry, and lines. Lynda is the professional training website from business social media giant Linkedin. Lynda’s courses feature high-quality video training of any number of topics to help you build marketable skills and expand your knowledge base. These are some of the highest quality courses out there, but they do come with a price tag. Luckily, Lynda offers a free month to try out their courses so you can see if it’s a good fit for you before beginning a subscription. 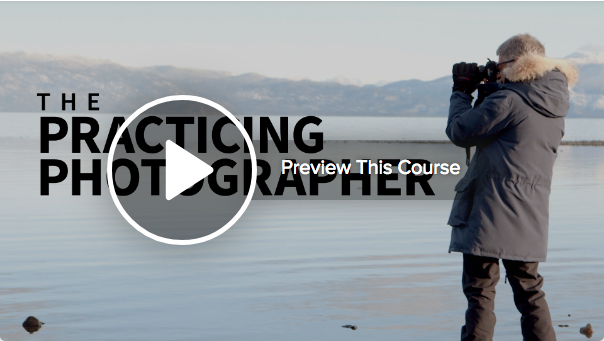 The Practicing Photographer is a quick 30 minutes web course designed to give students a feel for what it’s like being a working photographer. This overview course quickly dives into different styles of cameras, lighting techniques, and post-processing programs. For a quick session, it covers a lot of ground. 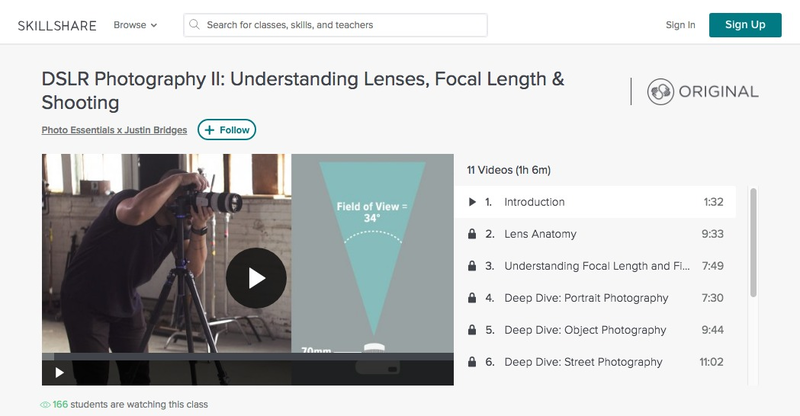 If you are interested in getting more in-depth information, Lynda offers learning paths specifically tailored to photography. 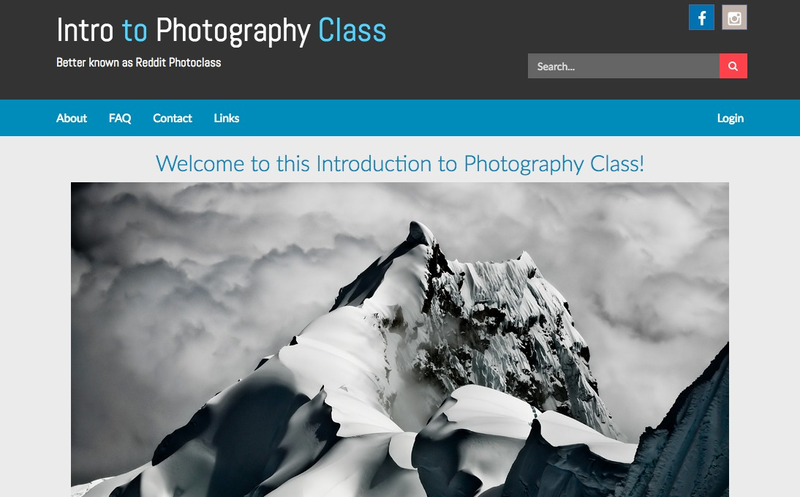 Their photography lessons online feature hands-on projects and learning assessments to ensure mastery of the material. 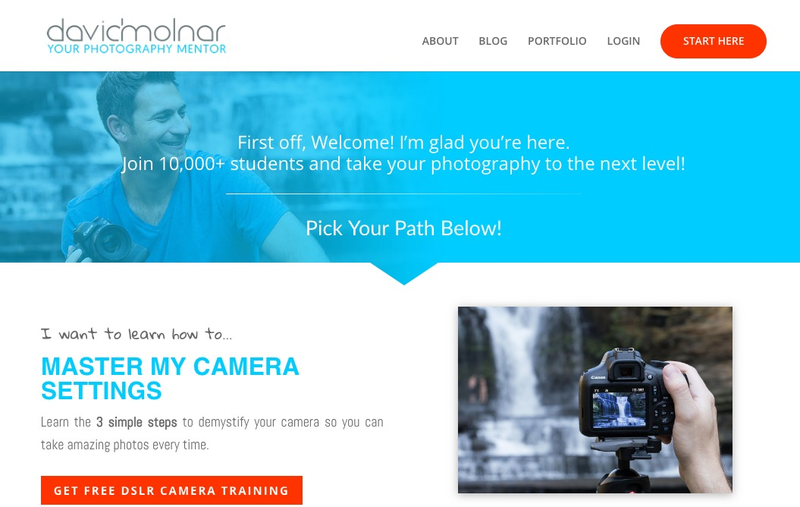 Whatsmore, their photography section includes over 600 courses and more than 25,000 video tutorials. Another offering from Lynda’s extensive catalog, The Elements of Effective Photographs covers more of the creative side of the art. This course is taught by Natalie Fobes, a National Geographic photographer. It covers topics like composition, leading lines, and exposure. The course also highlights the use and control of light, whether in the studio or outdoors. This focus on compositional elements, using movement to capture emotion, and proper lighting will be refreshing if you’re getting bogged down in the technical side of camera settings and equipment. If you are looking for a more hands-on, specific course for portraiture then look no farther than Lindsay Adler’s course. 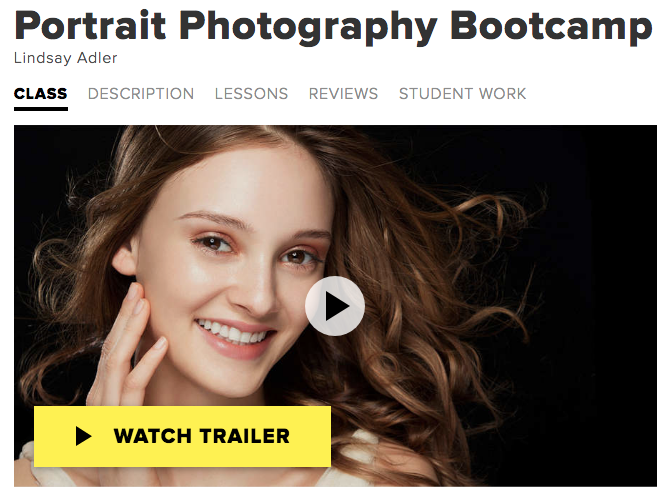 This well thought out course covers all of the essentials of shooting portraits and is an excellent reference for all photographers. From the basics like camera settings, lighting, and lens selections, to advanced posing techniques for individuals and groups, this course covers it all. 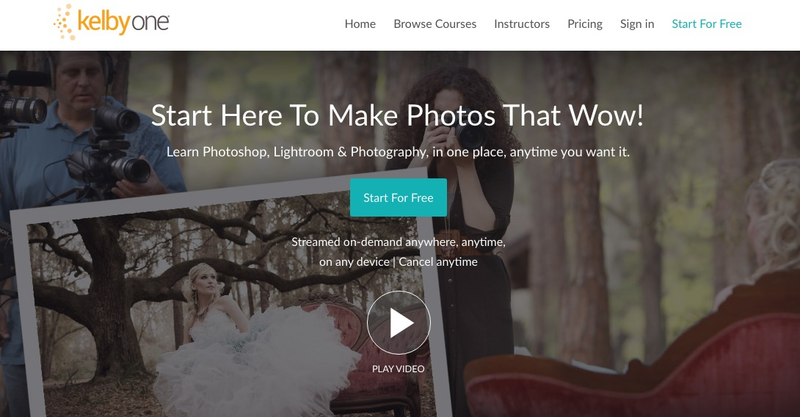 Creativelive’s offers quite a few specialized courses in photography, as well as a few general beginner’s courses. No matter what topic you are interested in or what skill you need to master, Creativelive has a specialty course for you. Another great offering on Creativelive’s course platform is the four-course bundle for beginning photographers. These four courses, when taken together, cover everything from basic camera settings, composition, lighting, and digital post-processing. 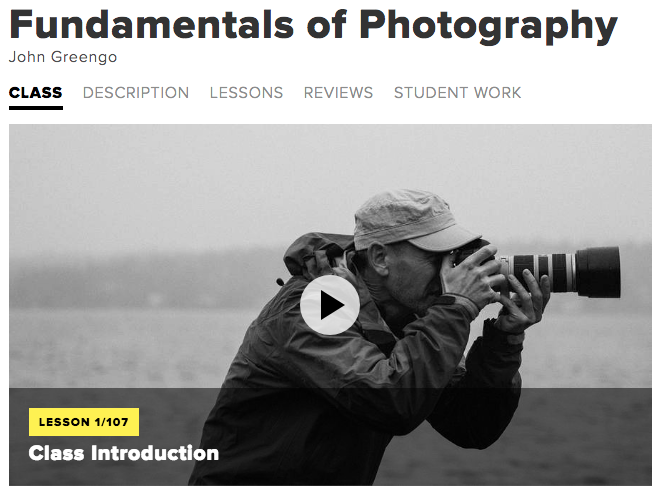 The Fundamentals of Photography course alone encompasses 107 video lessons and is a fantastic class to introduce you to the basics of photography. The following online photography courses are included in the bundle but are also available separately. Kelbyone, the website started by professional photographer and author Scott Kelby, is chockablock full of great photographic courses. Fifteen courses are available if you sign up for a free membership, the rest of the 1,000 plus video catalog requires a paid Plus or Pro membership. Industry leading photographers and experts teach classes, so there are probably a few instructors whose names you’ll recognize. Kelby's own “Beginners Start Here” course covers the basics of photography, and several other free courses cover topics of interest to aspiring photographers. You will find classes that include every aspect of photography, from lighting and composition to business techniques and equipment reviews. 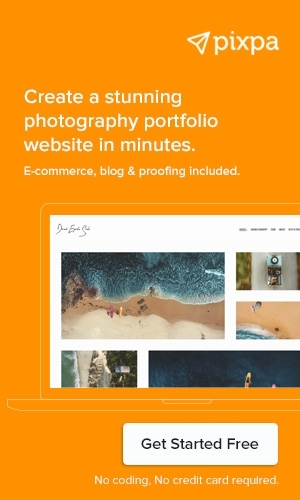 Jerad Hill is a wedding photographer and website designer with an eye for the business of making money online from photography. In his free, well-designed course, you’ll learn the basics of camera settings and all that you need to master the exposure triangle and light. Jerad Hill’s website also includes other courses, some paid and some free. 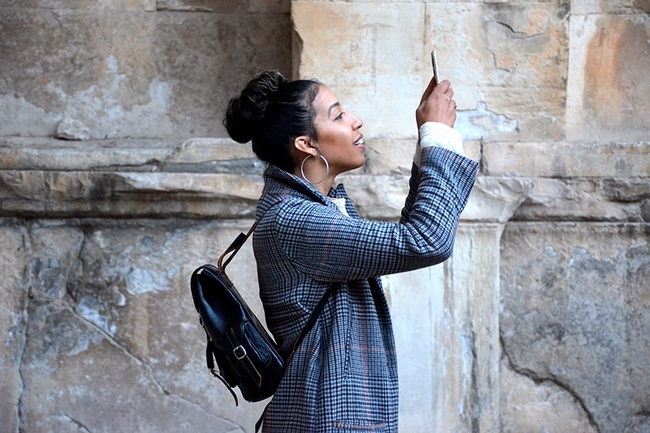 Many courses cover topics like using Foursquare or Instagram to promote your business, which are extremely handy for photographers looking to start their own companies. Coursera is a leading online platform provider for MOOCs, or massive open online courses. Many of the MOOCs offered on the site are provided by accredited universities and colleges. The photography specialization is available from Michigan State University. This is a seven-month program with flexible deadlines and scheduling to meet your needs. Upon completion of the program and the hands-on projects, you earn a certificate in photography which is great for your resume and employment options. As a freelancer, certifications help bolster your marketability and credibility with clients. The following five courses are included in the Photography Basics and Beyond specialization. One of Shaw Academy’s stated goals is to “reskill and upskill the world.” Their professional diploma programs are accredited by the European Qualifications Framework. Their courses and programs vary from photography and video to design, marketing, and even health and wellness. Specifically, their Diploma in Photography consists of five modules each taking four weeks of study time. The first module alone includes many of the basics skills photographers might be looking to master, including composition, lighting and equipment basics. The first seven days of membership with Shaw is free, and then each month is billed as a membership. 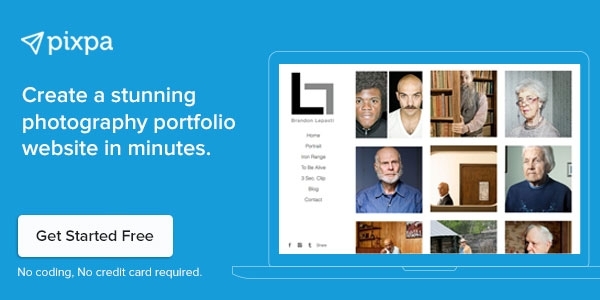 Designed initially for Reddit, lifestyle photographer Alex Buisse put together this immensely popular class on his own website. The text-based course takes the student through thirty lessons, from "What is a Camera" to "Sharing your Work" and "How to Go Further." The course is easy to follow and covers all the essential basics, plus some professional level insights into RAW files and using tools like the histogram function in your camera. Each lesson includes an assignment to hone your skills. Alex’s stunning photos help illustrate points. Best of all, the no-nonsense site isn’t bogged down by advertising or sales gimmicks. 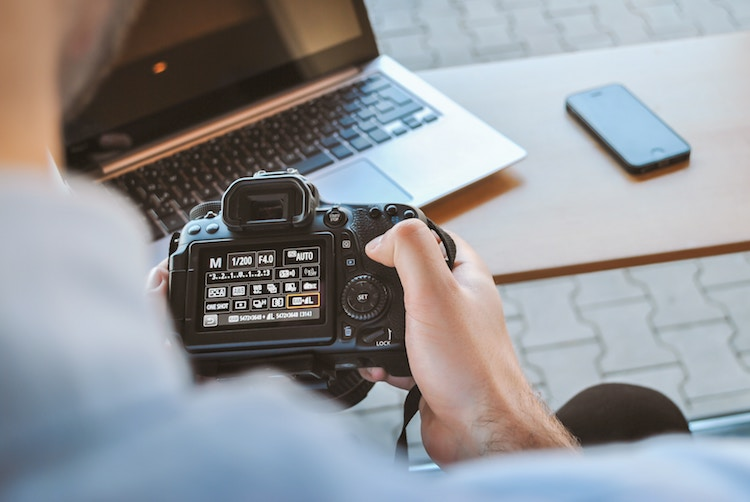 These 17 courses aren’t the only online photography courses out there, but they provide a great start to laying the foundations of your photography knowledge base. 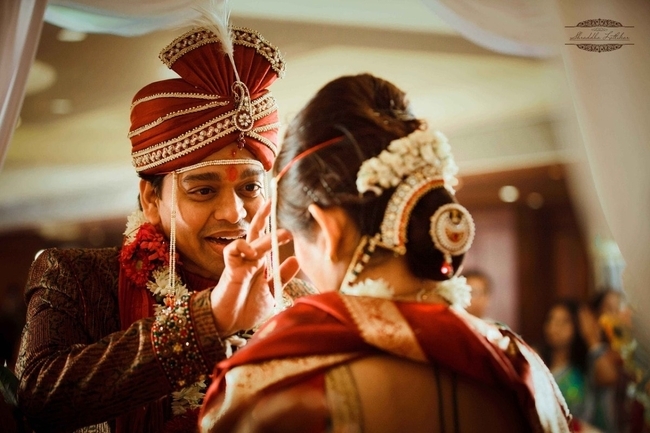 Photography is a varied field with many specializations and areas where we can all learn more. Thankfully, online learning has empowered us all to keep learning and to keep improving our skills. What skill do you want to learn next?